As told by Ed Kaufmann, Joe Coffee Director of Sourcing. As we began roasting our own coffees here at Joe in 2012, of the earliest selections on our menu was purchased through a coffee exporter/importer called Caravela Coffee based in Bogota, Colombia and Chapel Hill, NC. The coffee was produced by a farmer named Wilmar Guarnizo in Tarqui, in the southern state of Huila, Colombia. We called it La Familia Guarnizo, and today, this family’s farms are among our favorite to visit. When we first got to know this coffee, we instantly wanted to dig deeper in order to learn more about Wilmar and other coffees from this region. 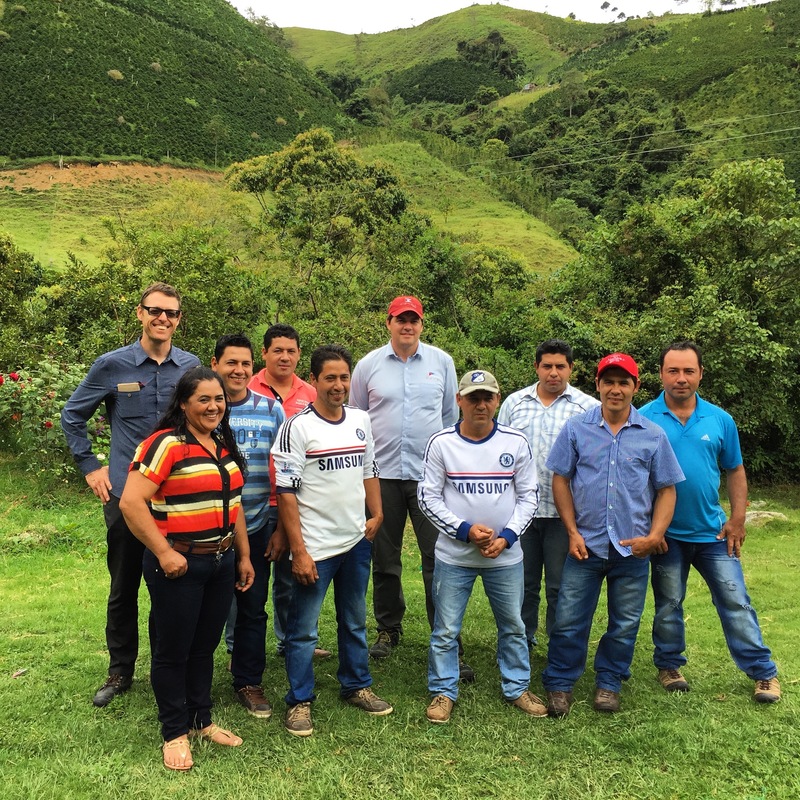 We learned that Wilmar’s family is part of a growers’ association called El Paraiso, which acts as a group to bring operating costs down. The association is funded by a percentage of revenue from the producers, so its member farmers choose to produce higher quality and sell it for higher prices to Caravela, whose exporting warehouse happens to be right next door to El Paraiso. Through our relationship with Caravela and El Paraiso, we have been exposed to a number of coffees from Wilmar and his extended family as well as other members of the association. We loved them so much that once we began roasting 100% of the coffee served in Joe cafes, these coffees made up a significant part of our menu. In 2014 I made my first visit to Tarqui and the Guarnizo family on behalf of Joe, a trip I now look forward to making every year to strengthen our ongoing relationship. The first year I visited the family as a green coffee buyer for Joe, I proposed we establish a fixed price contract where Joe would pay the same amount each year regardless of what the coffee commodities market was doing. The benefit of this is that the seller can count on a stable price for the coffee they produce, rather than be at the mercy of the ever-fluctuating market. The Guarnizo family includes ten siblings, each with their own section of small farms—all of whom all signed on to this original contract. My latest visit to the Guarnizos was this past August. Tarqui is somewhat remote—it takes about two days to get there from New York City. The nearest airport is in Pitalito, about an hour and a half away from Tarqui. The airport has a physical control tower but no one works there so the pilots flying small turbo-prop planes land by sight and radar as they see fit. Rory Gowan from Caravela met me at the airport and we went straight to one of Caravela’s purchasing stations in Pitalito to taste some coffees before heading out to our visit with the Guarnizos. The drive to Tarqui was easy except for a section of the road that was being repaired and reduced the highway to one lane with cars taking turns going through the bottleneck. When we arrived in Tarqui, we picked up Marisela Trujillo who is part of Caravela’s PECA (Programa de Educación a Caficultores) team. They visit producers regularly and offer technical consultation to help them raise their quality. We drove another 45 minutes up the eastern side of the central cordillera of The Andes Mountains and rolled into the field in front of Wilmar’s house. It sits on top of a hill like a bright green monastery, with his plastic-tarp-covered solar coffee-drying structure right next to the house, and his processing equipment behind the dryer. The view from Wilmar’s porch is a stunning expanse overlooking the Eastern Cordillera of the Andes. It was great to be back. Most of the siblings were there to greet us. We caught up the best we could through Rory, who was translating for both them and me. (My Spanish is ok but I think we both have a hard time understanding each other’s accents.) Wilmar talked about some of the changes he has made to his drying techniques which have allowed him to improve his quality. We had sancocho for lunch which is a typical Colombian soup served with rice, chicken (probably “prepared” that morning), yucca and corn. There were too many of us to sit at the table at once so half of us ate while the others waited outside and they took their turn. I always make the same joke: I slurp the soup broth very loudly like I’m evaluating it as I would evaluate coffee and I yell “NOVENTA!” meaning that the soup is a 90-point soup, very high scoring. It’s my silly way of complimenting Wilmar’s wife Tania for preparing such a nice meal for us, but it never fails to make everyone laugh and break the ice. After lunch, several of us hiked around Wilmar’s farm, Finca La Vega, and talked about different cultivars of coffee he was growing. It was a magical setting to be in while telling him how much our customers love their coffee back in NYC. 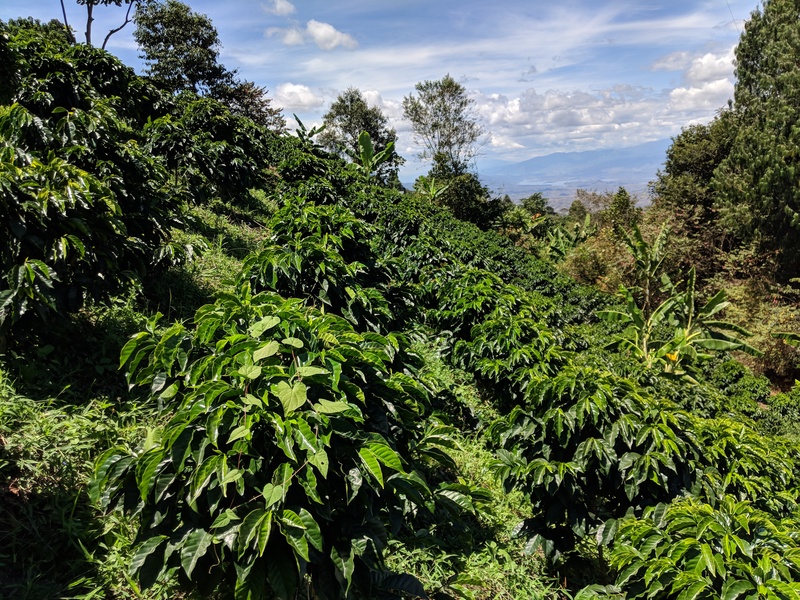 We looked out over the patchwork green valley between the Central and Eastern Cordilleras and talked about the very low coffee commodity futures price, something that is having huge impacts on many coffee producers around the world. For many farmers, the price they are paid is in relation to this ever-fluctuating futures market, unless the producer has a fixed price contract with a roaster, which we do with them. I was proud of the work we had all put in to devising the contract years ago and the work they’ve put in to maintain the quality that we need and our customers are accustomed to. After we explored La Vega, we drove to Jose Javier’s farm, El Triunfo. We spoke with Jose Javier about coffee prices as well and he showed us his new drying structure that has a sturdy tin roof as opposed to plastic. It is stronger and provides more shade for slower drying which can be very beneficial for coffee quality. We all had a cup of coffee roasted by one of the brothers, Yimmy in a pan on the stove with a stick. It was delightful! We said our goodbyes and headed back to Pitalito to settle in for the night and prepare for the next leg of our journey home, already looking forward to next year’s visit to our partners the Guarnizos.